Electronics System Design & Manufacturing sector covers electronic hardware products relating to IT and office automation, telecom, consumer electronics, electronic components, etc., It also includes avionics, solar photovoltaic, strategic electronics, nano electronics, medical electronics, space & defence related items, design related activities like product design, chip designing, VLSI, board design, embedded systems etc. This is not the complete list and any queries related to items falling under the scope of ESDM sector will be decided by the Department of Electronics & Information Technology, Ministry of Communications and Information Technology. Q.2 What are the objectives of the national policy on electronics? To achieve a turnover of about USD 400 billion by 2020 involving investment of about USD 100 billion and employment to about 28 million people. To build on the emerging chip design and embedded software industry. To build strong supply chain of raw materials, parts and electronic components. Its strategies include creation of eco-system, promotion of exports, human resource development, maintenance and development of standards, cyber security etc. Q.3 Can foreigners invest in ESDM sector in India? The investor will need to comply with the reporting requirements of the RBI and comply with all other relevant central & state laws & regulations. Q.4 Are there any industry associations/agencies in electronics sector to promote development of industry, promote collaborations & facilitate foreign investors? Yes, India has chambers of commerce and electronics associations which are playing an important role in policy advocacy, promoting industry and helping in match making of foreign companies with Indian counterparts etc. Some of the JV opportunities are also available on MeitY website and can be seen from the following link-( http://meity.gov.in/esdm). In this see the section on technology offers for potential manufacturers. Queries can also be posted on the website – www.investindia.gov.in Please click on “SEND YOUR QUERY” link on homepage. Q.5 As a foreign investor, what kind of a business entity can I set up? Q.6 Who all can invest in India, i.e. constitution and nature of investing entity? The investing entity can be an individual, company, foreign institutional investor, foreign venture capital investors, foreign trust, private equity fund, pension/provident fund, sovereign wealth fund, partnership/proprietorship firm, financial institution, non-resident Indians/person of Indian origin, others, etc. Citizens/entities from Pakistan and Bangladesh can invest in an Indian company only through the government route. In addition, an entity/citizen from Pakistan cannot invest in defence, space and atomic energy sectors. Citizens/Entities of Pakistan, Bangladesh, Sri Lanka, Afghanistan, Iran, and China can establish a branch or a liaison office or a project office or any other place of business with the approval of the Reserve Bank of India which takes a decision on the application in consultation with the Government of India. For all forms of structure: The investor needs to comply with other relevant sectoral & state laws and regulations and also the provisions of Companies Act. Q-8 What are the rules and regulations for setting up a company in India? A foreign corporate can invest and start its operations in India by incorporating a wholly-owned subsidiary under the provisions of Companies Act 1956. It is treated at par with a domestic company and all rules and regulations applicable to an Indian company equally apply to wholly owned subsidiaries. Another option is to enter into a joint venture with an Indian by forming a company. The management and running of the JV is influenced by the terms stated in the shareholders agreement. A company set-up in India can either be private limited or public limited. Public limited company: A public company is defined as one that is not a private company. A subsidiary of Indian public company is also treated as a public company. A public company is required to have a minimum paid-up capital of INR 500,000 with minimum of 7 shareholders and 3 directors. It requires a minimum of two shareholders and two directors (both of them can be foreigners). It can be formed with a minimum capital of INR 100,000. It can raise loans from banks, financial institutions, etc. The number of shareholders cannot exceed 50. It cannot invite the public to subscribe to its shares or debentures. It can raise debt in foreign currency in the form of external commercial borrowings. Generally for foreign investors opening a private limited company is considered as the most popular mode of entry. c. At the time of incorporation of company, it is mandatory to submit particulars of registered office. IV Post incorporation formalities a. Obtaining permanent account number (PAN), opening the bank accounts, tax deduction account number (TAN) for the company. b. Filing with Reserve Bank of India for the subscriber (initial) capital. The forms and other details can be seen from the following link-(http://www.mca.gov.in). Most of the activities can be done online. It is preferable to engage the services of a professional agency in carrying out above activities. Alternatively the foreign investor can also acquire shares in existing company: Subject to FDI sectoral policy (relating to sectoral caps and entry routes), applicable laws and other conditionality’s including security conditions, non-resident investors can also invest in Indian companies by purchasing/acquiring existing shares from Indian shareholders or from other non-resident shareholders. The Form FC-TRS should be submitted to the AD Category-I Bank, within 60 days from the date of receipt of the amount of consideration. The onus of submission of the Form FC-TRS within the given timeframe would be on the transferor/transferee, resident in India. The sale consideration in respect of equity instruments purchased by a person resident outside India, remitted into India through normal banking channels, shall be subjected to a Know Your Customer (KYC) check by the remittance receiving AD Category-I bank. Prior permission of RBI in certain cases for transfer of capital instruments: (i) Transfer is at a price which falls outside the pricing guidelines specified by the Reserve Bank from time to time and the transaction does not fall under the exception given in para 3.4.5.2. of FDI policy that can be seen from the Page No.22 & 23 of the following link-( 0 byteshttp://dipp.nic.in/English/Policies/FDI_Circular_01_2013.pdf 0 bytes),(ii) Transfer of capital instruments by the non-resident acquirer involving deferment of payment of the amount of consideration, (iii) Transfer of any capital instrument, by way of gift by a person resident in India to a person resident outside India. Indian companies have been granted general permission for conversion of External Commercial Borrowings (ECB) (excluding those deemed as ECB) in convertible foreign currency into equity shares/fully compulsorily and mandatorily convertible preference shares, subject to the conditions and reporting requirements. General permission is also available for issue of shares/preference shares against lump sum technical know-how fee, royalty, subject to entry route, sectoral cap and pricing guidelines (as per the provision of para 3.4.2 above) and compliance with applicable tax laws. Q.9 What are the instruments allowed for receiving FDI? The instruments for receiving FDI include: Investments made in equity shares, fully and mandatorily convertible preference shares and fully and mandatorily convertible debentures with the pricing being decided upfront as a figure or based on the formula that is decided upfront. Issue of warrants, partly paid shares etc require prior approval of FIPB. Issue of non-convertible, optionally convertible or partially convertible preference shares/debentures needs to comply with the external commercial borrowing (ECB) guidelines of the RBI. The inward remittances received by the Indian company vide issuance of DRs and FCCBs are treated as FDI and counted towards FDI. Q.10 What are the rules relating to pricing of issue of shares? The price as applicable to transfer of shares from resident to non-resident as per the pricing guidelines laid down by the Reserve Bank from time to time, where the issue of shares is on preferential allotment. Q.11 How can a foreign investor transfer funds into an Indian company? The modes of transfer allowed are: (i) inward remittance through normal banking channels. (ii) debit to NRE/FCNR account of a person concerned and maintained with an Authorized Dealer category-I bank-(AD category-1 bank) ( 0 byteshttp://rbidocs.rbi.org.in/rdocs/FEMAMASTER/PDFs/1061.pdf 0 bytes) (iii) conversion of royalty/lump sum/technical knowhow fee due for payment, or conversion of ECB, shall be treated as consideration for issue of shares (iv) conversion of import payables/pre incorporation expenses/share swap can be treated as consideration for issue of shares with the approval of FIPB (v) debit to non-interest bearing escrow account in Indian Rupees in India which is opened with the approval from AD category-I bank and is maintained with the AD category I bank on behalf of residents and non-residents towards payment of share purchase consideration. Q.12 What are the reporting requirements of the Reserve Bank of India? Reporting requirements to the RBI: The Company has to report within 30 days of receiving the application money (inward remittance); intimation is to be made to the concerned regional office of the RBI in respect of the inward bank remittance received in the prescribed form. The company is also required to intimate the RBI within the 30 days of issuing shares to the foreign investor in the prescribed form. The RBI will issue a registration number to the company which is to be mentioned for future correspondence with the RBI, while repatriating funds, etc. The capital instruments should be issued within 180 days from the date of receipt of the inward remittance received through normal banking channels including escrow account opened and maintained for the purpose or by debit to the NRE/FCNR (B) account of the non-resident investor. In case, the capital instruments are not issued within 180 days from the date of receipt of the inward remittance or date of debit to the NRE/FCNR (B) account, the amount of consideration so received should be refunded immediately to the non-resident investor by outward remittance through normal banking channels or by credit to the NRE/FCNR (B) account, as the case may be. Non-compliance with the above provision would be reckoned as a contravention under FEMA and would attract penal provisions. Apart from the company needs to comply with reporting requirements of Registrars of companies like filling form 2 etc. Reporting of transfer of shares between residents and non-residents and vice- versa is to be done in Form FC-TRS within 60 days. The Indian company issuing ADRs / GDRs has to furnish to the Reserve Bank, full details of such issue in the prescribed form, within 30 days from the date of closing of the issue. Q.13 Are investments and profits earned in India repatriable? Q.14 Can a company in India be wound up? Q.15 What are the rules and regulations for the establishment of a Branch office or other place of business in India? 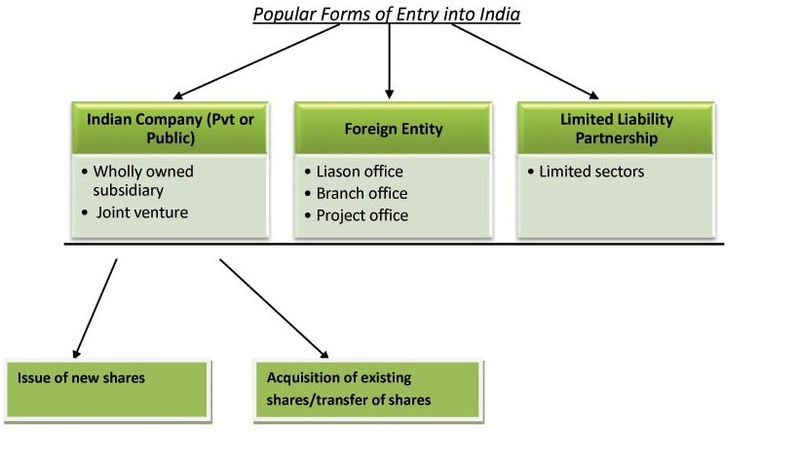 The process of opening a LO/BO/PO is as follows: Foreign companies/entities desirous of setting up of Liaison office/Branch office (LO/BO) are required to submit their application in Form FNC along with the documents mentioned therein to Foreign Investment Division, Foreign Exchange Department, Reserve Bank of India, Central Office, Mumbai, through an authorised dealer bank. Project Office: The RBI has provided a general permission to foreign companies for establishing POs in India, provided they have secured a contract from an Indian company to execute a project in India and (i) the project is funded directly by inward remittance from abroad; or (ii) the project is funded by a bilateral or multilateral International Financing Agency; or (iii) the project has been cleared by an appropriate authority; or (iv) a company or entity in India awarding the contract has been granted Term Loan by a Public Financial Institution or a bank in India for the project. However, if the above criteria are not met, then such applications need to be forwarded to the RBI. The RBI has also provided the general permission for opening a BO in SEZs provided such units are functioning in those sectors where 100% FDI is permitted; such units comply with the Part XI of the Company’s Act 1956 and function on a standalone basis. It should, however be noted that general permission in case of PO/BO is not available to investors from Pakistan, Afghanistan, Bangladesh, Sri Lanka, Iran and China. ? General permission means no prior approval is required from RBI subject to prescribed conditions. Within 30 days of obtaining approval from the RBI, a Form of Establishment (Form No. 44), is required to be filled and filed with the RoC along with the prescribed documents. The LO/BO/PO also needs to comply with Part XI of the company’s act 1956. (Section 591 to 608). The other rules and regulations relating to LO/BO/PO can be seen from the RBI master circular- (https://www.rbi.org.in/scripts/BS_CircularIndexDisplay.aspx?Id=7312). Q.16 What are the permissible activities which LO/BO can undertake? Liaison Office: A LO (also known as Representative Office) can undertake only liaison activities, i.e., it can act as a channel of communication between the head office abroad and parties in India. It is not allowed to undertake any business activity in India and cannot earn any income in India. Expenses of such offices are to be met entirely through inward remittances of foreign exchange from the head office outside India. Permission to set-up a LO in India is initially granted for a period of 3 years and this is likely to be extended from time to time. Upon expiry of the validity period, these entities have to either close down or be converted into a Joint Venture (JV) / Wholly Owned Subsidiary (WOS), in conformity with the extant Foreign Direct Investment policy. Specified Activities: (i) Representing in India the parent company/group companies; (ii) Promoting export/import from/to India; (iii) Promoting technical/financial collaborations between parent/group companies and companies in India; (iv) Acting as a communication channel between the parent company and Indian companies. Specified Activities: (i) Export/import of goods; (ii) Rendering professional or consultancy services; (iii) Carrying out research work, in areas in which the parent company is engaged; (iv) Promoting technical or financial collaborations between Indian companies and parent or overseas group company; (v) Representing the parent company in India and acting as buying/selling agent in India; (vi) Rendering services in information technology and development of software in India; (vii) Rendering technical support to the products supplied by parent/group companies; (viii) Foreign airline/shipping company. Q.17 What are the repatriation rules, reporting requirements, etc., in case of LO/BO/PO? Q.18 Can LO/BO/PO be closed down? Q.19 What is a Limited Liability Partnership? Limited Liability Partnerships: The LLP format allows corporate business entity along with the benefits of limited liability. At the same time, it allows the members the flexibility of organizing their internal structure as a partnership based on mutually-agreed terms. Like a private limited company, LLP is a body corporate having a distinct legal entity. The LLPs are governed by the LLP Act 2008. However, the RBI has still not notified the LLP structure in FEMA. FDI will be allowed through the government approval route, only in LLPs operating in sectors/activities where 100% FDI is allowed through the automatic route and sectors are not subject to additional conditions. The other details can be seen from page numbers 16 and 17 on the following link-( 0 byteshttp://dipp.nic.in/English/Policies/FDI_Circular_01_2013.pdf 0 bytes). The LLP act and rules can be seen from the following link- (http://www.mca.gov.in/). Q.20 Is it possible to dissolve the LLP in India? The details of LLP closure can be seen from the following link- (http://www.mca.gov.in/). Q.21 What are other main registrations required by a company or BO/PO/LO in India? Q.22 What are the other auditing and annual reporting requirements to be followed in case of companies & BO/PO/LO operating in India? Accounting: All businesses in India need to maintain accounting records, which meet the generally-accepted accounting principles. In India, a business entity is free to choose its accounting year. However, under income tax laws, it is mandatory to close books of accounts on a financial year basis from April 1 to March 31 of next year. Employment Payroll: Business is needed to draft appropriate employment contracts keeping in view the income tax laws and employment regulations. Tax Audit: LO is not required to do a tax audit. Companies are also required to undergo a VAT audit. Office space: At the time of incorporation of company, it is mandatory to submit particulars of registered office. Business entities are free to buy or lease the office space. Q.23 What are the different steps for starting a manufacturing unit? Setting up a company or any other form of business: The business structure can be a company, a branch office in an SEZ, or the LLP. The details about each form are given in Section I and Section II. Project Approval: Preparing the detailed project report and getting an approval from the concerned state government department. Factory Land/Office Space: While setting up a factory, acquiring an industrial land with a clear title is the key step. State governments have empowered industrial development corporations (IDC’s) which develop land for industrial use. These IDC’s require that an application may be submitted specifying the desired area size along with the proposed business plan. Applications are reviewed and merits considered before land is allotted. The general information on various state governments can be seen from the presentations available on each state government on the following link-(http://www.ibef.org/states.aspx). In this download the state report. Factory Construction: Once the land is indentified and before commencing construction, the company has to submit a factory plan which will normally require an approval by the concerned industrial corporation. Each state industrial corporation has its own building bye-laws. In addition, there are other clearances or approvals. Once construction is complete, an industrial corporation normally requires the company to obtain the completion certificate. Human Resource Hiring and Management: It includes complying with various labour laws. The details of which can be obtained from the labour department of the state government. Some of the important laws are Industrials disputes Act, 1947, Trade unions Act, Payment of bonus Act, 1965, Payment of gratuity act, 1972, Minimum wages Act, 1948, Payment of wages Act, 1936, Factories Act, 1948, etc,. * Link to Ministry of labour-(http://labour.nic.in/). Q.24 Are there any other state/Central level regulations? Yes, there are many other state-level regulations like getting approvals from the fire department, the pollution control board, and environment ministry in some cases. The rules and regulations are different in each state. The Government of India is soon going to launch an initiative for all business interactions with the government under one single window known as “eBiz” ( https://www.ebiz.gov.in/).License & permit wizard of this eBiz project gives an indication of the license and permits required for setting up the project. The details can be seen from following link-(https://www.ebiz.gov.in/). The link gives only the indicative list of approvals required for 5 areas. We provide below, some of the clearances that may be required. The above is an indicative list only. Q.25 What are the financing or funding options available to carry a business in India? Q.26 What are Special Economic Zones and Free Trade Warehousing Zones? Units in SEZ or FTWZ shall be a positive net foreign exchange earner (NFE). NFE shall be calculated cumulatively for a period of five years from the commencement of production. A branch office can undertake manufacturing activities in an SEZ unit. 100% income tax exemption on export income SEZ units under Section 10AA of the Income Tax Act for the first 5 years, 50% for the next 5 years thereafter and 50% of the ploughed-back export profit for the following 5 years. Exemption from Central Sales Tax, exemption from service tax. Exemption from state sales tax and other levies as extended by the respective state governments. Single-window clearance for central and state level approvals.It should, however, be noted that a minimum alternate tax @18.5% and DDT are applicable in case of units operating in SEZs and other export-oriented parks. Q.27 What are Export Oriented Units (EOU’s), Export Technology Hardware Parks (ETHP) & Software Technology Parks (STP’s)? Income tax holiday of 10 years for the competing policies like STPI/EHTP/BTP etc are already over. (Ended on 31 March 2011). Rest of the incentives is similar to those available for SEZ units given in Q.26 above. Q.28 What is national manufacturing policy and national investment and manufacturing zones (NIMZs)? The National manufacturing policy, approved on October 25, 2011, is the first of its kind for the manufacturing sector as it tries to address some critical constraints for Indian manufacturing sector in the area of regulations, infrastructure, skill development, technology, availability of finance, exit mechanism etc. The policy envisages the creation of National Investment and Manufacturing Zones (NIMZs). NIMZs will be large areas (minimum 5000 hectares) of developed land, with requisite eco-system for promoting world class manufacturing activity. NIMZ will be a self-governing and autonomous body. The policy provides for specific incentives for technology development and there is a special focus on green/clean technology. Special benefits/measures for SMEs in national manufacturing policy. Q.29 What are Electronic Manufacturing Clusters? A) Brownfield electronic manufacturing clusters are those existing areas which are notified by MeitY. For a unit to be eligible for Modified Special Incentive Package Scheme (M-SIPS) it should be located within the brownfield EMC. MeitY notifies brownfield EMC considering geographical area, infrastructure availability etc. So it is possible to notify new brownfield EMC if it is already not notified. B) The brownfield EMC’s already notified can be seen from the following link-(http://meity.gov.in/esdm). The focus is on upgrading infrastructure and providing common facilities for ESDM units. Q.30 What is the mode of implementing the scheme of EMCs? The scheme is implemented through the special purpose vehicle (SPV) which will carry out the business of developing, operating and maintaining the infrastructure, amenities and other common facilities created in EMCs. Q.31 Who will be the chief promoter? Chief promoter for the purpose of the scheme is a legal entity which initiates the proposal for a project in a brownfield or greenfield EMC and takes such steps as are necessary for getting the project approved under the scheme, getting the SPV formed and entrusting the project to an SPV in accordance with the scheme and guidelines. A chief promoter may be an individual, registered company or society, industry association, financial institution, R&D institution, state or local government or their agencies or unit/units within an EMC. Q.32 What are the financial assistance provided for EMC’s? Brownfield EMC: The assistance will be restricted to 75% of project cost subject to ceiling of INR 0.5 Billion. The remaining project cost shall be financed by other stakeholders of the EMC with a minimum industry contribution of 15% of the project cost. Greenfield EMC: The assistance will be restricted to 50% of the project cost subject to ceiling of INR 0.5 Billion for every 100 acres of land. The remaining project cost shall be financed by other stakeholders of EMC with a minimum industry contribution of 25% of the project cost. The administrative expenses would be restricted to 3% of the central assistance in the project. Expenses towards preparation of detailed project report would also be considered a part of project cost. Q.33 What is the land ownership in EMC? The land for the EMC & Project is owned by the applicant. The land for the project is owned by the applicant but remaining land is not owned by the applicant. In such cases, it is for the applicant to demonstrate his ability to meet the terms of scheme and guidelines with the involvement of the constituents units in the EMC. Q.34 How to get land for Greenfield EMC? Centre or state or local government or its agency participating as equity partner in the SPV wherein the cost of land is provided as its share. Q.35 Does national manufacturing policy applies to EMC? Yes, national manufacturing policy shall be applicable to Greenfield EMC which would fall within the NIMZs. A collection of EMCs, geographically outside the proposed NIMZs may be treated as a single virtual NIMZ for governance purposes. Q.36 What are the dates for applicability of EMC scheme? The scheme will be open for applications for 5 years from the date of notification (November 07, 2012) further period of 5 years shall be available for disbursement of funds to approved applicants. The applications received under the scheme will be appraised on an ongoing basis. The benefits of SEZ are not applicable to unit operating in EMC unless and until EMC is classified as SEZ. Q.37 What are various forms of taxation in India? 4) Central sales tax/value added tax: Tax on value addition at each level of the distribution network. Tax levied interstate is known as Central Sales Tax. 5) R&D cess: It is a cess on all payments made by an industrial concern for imported technology. 6) Other indirect taxes include: Stamp duty, octroi, property tax etc. • Most of the taxes are cenvatable that is it can be squared off against paid taxes. • Government of India is actively considering Goods & Services Tax which will subsume several of above indirect taxes. 8 Service Tax Peak Rate is 12.36%. Peak Rate is 12.36%. 9 Import Duties/Customs Duty (India is signatory to ITA-1 which provides for ZERO basic custom duty rate on import of specified items) The peak rate of basic custom duty is 10% (this rate can vary depending upon the item specification). The peak rate of basic custom duty is 10% (this rate can vary depending upon the item specification). 3 Property Tax Property tax/real estate tax is payable as per local municipal laws on commercial and residential property owned. Property tax/real estate tax is payable as per local municipal laws on commercial and residential property owned. Corporate tax (Taxes on net income), minimum alternate tax (in case company gets exemption on corporate tax), tax on royalty/fee for technical services, dividend distribution tax, withholding tax, withholding tax on interest etc. Carry forward of losses are allowed for 8 years and companies are allowed to have depreciation and amortization allowances. Minimum Alternate Tax: Indian tax law requires MAT to be paid by corporations on the basis of profits disclosed in their financial statements in cases where the tax payable according to the regular tax provisions is less than 18.5% of their book profits (plus surcharge and education cess). However tax credit (in case MAT paid is more than tax payable as per normal provisions of the ACT) is allowed to be carried forward for 10 years. Withholding Tax: Businesses need to withhold tax on specified payments viz salary, contractual, brokerage, commission, professional fee etc. 5 Social Security Benefits Every establishment in India, employing 20 or more persons is required to register with the social security authorities unless they are an exempt establishment. For Indian passport holders, social security contribution is optional for employees if their salary exceeds INR 6,500 per month. Every establishment in India, employing 20 or more persons is required to register with the social security authorities unless they are an exempt establishment. For Indian passport holders, social security contribution is optional for employees if their salary exceeds INR 6,500 per month. 6 International Worker International worker may get exemption from social security regulations, if there is SSA with the country, and the worker is contributing in his/her own country and for defined terms and conditions in relevant SSA. International worker may get exemption of social security regulations if there is SSA with the country, and the worker is contributing in his/her own country and for defined terms and conditions in relevant SSA. • There is no dividend distribution tax on LLP’s. Q.38 Does India has double taxation avoidance agreements and free trade agreements? • It also provides taxability of business profits if the company has permanent establishment in India. A building site or construction, installation or assembly project constitutes a permanent establishment only if it continues for a period of more than 183 days in any fiscal year. Q.39 What are the reporting requirements related to taxes? Tax liability in India can either be discharged through the advance tax mechanism or the tax withholding mechanism. Under the advance tax mechanism, one estimates the entire year’s tax liability and deposits through three annual installments, i.e. September 30 (30%), December 15 (30%) and March 15 (40%). An LO is not required to pay corporation or withholding tax as there is no income. Q.40 What are the various types of Visas? Government of India issues the following visas: Business Visa, Conference Visa, Diplomatic Visa, Employment Visa, Emergency Visa, Entry Visa, Journalist Visa, Medical Visa, Missionaries Visa, and permit to re-enter within 2 months, Research Visa, Student Visa, Tourist Visa, and Transit Visa. Please follow the link for details on Visa Provision and supporting documents. (http://indianvisaonline.gov.in/visa/). Preferable visas from an industry point of view are business visa, employment visa and conference visa. · FAQs relating to work-related visas (business/employment) issued by India can be seen from the following link- (http://mha.gov.in). · FAQ relating to conference visa can be seen from the following link- (http://mha.gov.in). Q.41 Is there any act to regulate competition in India? Q.42 Can companies in India enter into foreign technology agreements? Technology Agreements: Foreign investment in technology agreements effecting payments for royalty, lumpsum fee for transfer of technology and payments for use of trademark/brand name are allowed under the automatic route, i.e., without any approval of the Government of India. Foreign technology includes technical know-how, design, drawing, engineering service and royalty. Use of foreign brand names/trademarks is permitted for sale of goods in India. Q.43 What are the various types of incentives available? There are various types of incentives available from Central and state government departments for establishing a manufacturing unit. The incentives differ among the states and registration will be required to obtain various kinds of incentives. Advance Authorization: Duty free imports of inputs allowed for exports provided minimum 15% value addition is achieved. The scheme also requires import to be completed in 12 months and exports within 18 months. Annual Advance Authorization: It is available only to exporters with at least 2 years of exports. The entitlement will be equivalent to 300% of the FOB value or INR 10 million whichever is more. The authorization will be valid for 12 months. Duty Free Import Authorization: Under this exporters are allowed to import inputs free of basic customs and or additional/SAD duty. Scheme covers only products under standard inputs output norms. It also required minimum value addition of 20%. Duty Drawback: Duty Drawback is the rebate of duty chargeable on imported material or excisable material used in the manufacturing of goods in and is exported. The exporter may claim drawback or refund of excise and customs duties being paid by his suppliers. Drawback Schedule covers now about 4600 products. • Export promotion capital goods scheme-Under the scheme import of capital goods at a zero basic custom duty is allowed for export purposes. The capital goods for pre/post production stage also permitted. The exports to be effected equivalent to 6 times the duty saved on capital goods. Exports to be completed in 6 years. • Focus Market Scheme: The basic objective is to offset high freight cost and other externalities to select international market. The benefit of 3% transferable duty free credit entitlement for specified countries. The special focus markets to get 4% benefits. • Focus Product Scheme: The basic objective is to encourage products with high export intensity/employment. Benefit of 2 or 5% transferable duty free credit entitlement for specified products. Certain products to get 2% bonus benefits. • Market Linked Focus Product Scheme: The basic objective is to incentivize exports with high employment intensity in rural and semi-urban areas. The benefit of 2% transferable duty free credit entitlement for specified products. • Market Access Initiatives: Under MAI scheme, financial assistance is provided for export promotion activities on focus country, focus product basis. Financial assistance is available for Export Promotion Councils (EPCs), Industry and Trade Associations (ITAs), Agencies of State Government, Indian Commercial Missions (ICMs) abroad and other national level institutions/eligible entities as may be notified. • R&D concessions: There are some deduction incentives for research and development expenditure. • Investment allowance (additional depreciation) at the rate of 15 percent to manufacturing companies that invest more than INR 1 billion in plant and machinery during the period 1.4.2013 to 31.3.2015. Q.44 Are there any incentives or schemes for electronics system design and manufacturing sector unit? · Modified special incentive package scheme (M-SIPS) provides for subsidy of 25% of capital expenditure in non-SEZs (and 20% in SEZs) for investments made for 10 years. In addition, reimbursement of central taxes and duties on specified projects is also provided for period of 10 years. The support is available for any stage of value-addition of the electronic product. Incentives start only when initial capital expenditure cross minimum threshold and thereafter it is given on annual capital expenditure. · Preference to domestically manufactured electronic goods in government procurement is provided. Q.45 When was the M-SIPS launched and what is the duration of the scheme? MSIPS was launched on 27 July 2012 and it will be applicable for 3 years from this date. Q.46 Can existing units claim benefits under M-SIPS? The MSIPS will be applicable to investments in new ESDM units and expansion of capacity/modernization and diversification of existing ESDM units. ESDM unit shall mean a unit engaged in design and manufacturing of the electronics and nano-electronics and their accessories. It includes all stages of value addition and also includes electronics manufacturing services. Expansion of existing unit would mean increase in the value of fixed capital investment in plant & machinery of an ESDM unit by not less than 25% for the purpose of expansion of capacity/modernization and diversification. Q.47 What are the items and investment thresholds under M-SIPS? Q.48 What is the meaning of capital expenditure for the purpose of claiming benefits under M-SIPS? The capital expenditure will be the total expenditure in land, building, plant & machinery and technology including R&D. The total cost of land exceeding 2% of the capital expenditure shall not be considered for calculation of incentives in this regard. Q.49When are the incentives released under M-SIPS? The incentives against the capital expenditure shall be released after the end of financial year in which the total investment exceeds the threshold value.Thereafter, the incentive shall be provided on annual basis on the value of investment on the value of investments made during the year and be restricted to the first 10 years from the date of approval of the unit under the scheme. The re-imbursement of central taxes and duties actually paid shall be released after the end of financial year in which unit commences production. Thereafter the incentive is released every year for 10 years. Q.50 What are the types of application under M-SIPS? Initial application: An application submitted by an applicant under the scheme containing requisite information, along with supporting documents along with application fee, and documents showing financial Closure of an amount not less than the threshold value as applicable for the project and also not less than 20% of the complete project. Follow on application: Follow up application for the purpose of the scheme means an application submitted by an applicant seeking approval of a second or subsequent phase of an approved project. The follow up application would be made in the follow up application form prescribed under the scheme, along with application fee and supporting documents with required financial closure of the amount required to implement the phase of the project proposed in the follow up application. The follow up application can be made only in those projects where the financial closure furnished at the time of initial application is for an amount less than the Approved Project cost. It is advisable to hire the services of the consultancy firm or industry association or chartered accountant to file an application for M-SIPS or EMC. The application for MSIPS can also be made online through the following link- (http://www.msips.in/MSIPS/). Q.51 Is Government of India encouraging semiconductor wafer manufacturing facilities? Q.52Is there any preference for domestically manufactured electronics items? Yes, the government has laid down the policy for providing preference to domestically manufactured electronic products. The electronics products having security implications and agencies deploying them will be notified. The notified agencies will be required to procure the notified electronic product from a domestic manufacturer to the extent prescribed in the notification. Q.53Is the procurement policy applicable to all ministries? Yes, the policy will be applicable to all ministries/departments and their agencies (except defence) for electronic products purchased for government purposes and not with view to commercial resale or with the view to use in the production of goods for commercial re-sale. Q.54What is the meaning of domestically manufactured item? The domestically manufactured electronic products are manufactured by companies that are registered and established in India and engaged in manufacturing in India and would include contract manufacturers. The electronics products shall meet the graded domestic value additions in terms of bills of materials. The electronic items manufactured by foreign companies registered in India are considered as domestically manufactured electronic products. Q.55Does state governments provide any incentives on setting up a manufacturing unit? Yes, each state government has its own incentive policy, which offers various types of incentives based on the amount of investments, project location, employment generation, etc. The incentives differ from state to state and are generally laid down in each state’s industrial policy. Q.56What were the electronics related interventions in last budget? Q.57 Is there any scheme for skill development in ESDM sector? Yes, MeitY has launched scheme for financial assistance to select states /union territories for skill development in ESDM sector. The scheme was launched on 31 October, 2013 and will be operational for 4 years. Q.58What is grant available in the scheme and who all will be the beneficiaries? The estimated grant in aid support from central government will be INR 1 billion. Target beneficiaries will be student studying at IX/X standards onwards, ITI’s, Polytechnics, under graduate (non-engineering), school drop outs from 8th pass onwards, ITI certificate holders, diploma holders, graduates, registrants in employment exchanges, unemployed sources in the non-formal sector. Q.59 What is the number of students targeted under the scheme and what will be the financial assistance? Q.60 Is there any scheme for skill development in electronic product design? Q.61 What are the policies relating to safety standards of electronics items? Q.62 What are the laws and regulations relating to protection of brands etc in India? Q.63 What is e-waste and are there any rules prescribed by MeitY in this regard? Q.64 Does MeitY publishes newsletters? Q.65 Is there any national-level investment facilitation agency in India? Yes, Invest India is the national investment promotion and facilitation agency for India. It has been set up as a not-for-profit joint venture between DIPP (Department of Industrial Policy and Promotion, Ministry of Commerce & Industry), state governments and FICCI. Invest India acts as the first point of reference for foreign investors, handholding them through the pre-investment phase, execution and after-care phases. (website: www.investindia.gov.in). If you require any assistance or still have some more questions, please send in your query by filling the form available on the following link- (http://www.investindia.gov.in/).